This is a crucial time in the life of White Pond, its natural environment and the surrounding neighborhoods. The waters of White Pond are beautiful and clear again. With water temperatures down from a high of 86 during the summer of 2016, the pond has recovered from the worse toxic algae bloom ever recorded. The Board of Health's no-swimming advisory was in effect for over two months last summer from July 8-September 15. This summer, there has been one short-lived bloom over the July 4th weekend. White Pond was featured last summer on Channel 5's Chronicle news program as a beautiful pond that is experiencing some of challenges of overuse, pollution and lack of management that afflict many of New England's rivers and lakes. It also raised the question of whether the increase in toxic algae outbreaks is related to global warming (according to EPA the two appeared to be closely linked). In his eye-opening 2014 book Walden Warming, Boston University biologist Richard Primack concludes, "The effects of climate change are already here in Concord, right now." Despite the positive measures being taken and increased awareness, the unprecedented closure of this popular pond remains a disturbing sign of degraded water quality and eutrophication. Although the pond is clear again, the water level has decreased the last few years. Measurements taken during the summer of 2016 show that our shrinking pond has dropped 6 vertical feet from its high water mark of 2010. In other words, if you were to stand where the present water line is now, the water would have been over your head 5 years ago. Last summer's dry spell has surely contributed to this. But water levels have been dropping for the past 5 years and possible causes may include a general drop in the water table, less water flowing in through underground springs, and pumping from the nearby Town well. Due to the recent rainstorms, the level of the pond has risen around two feet. 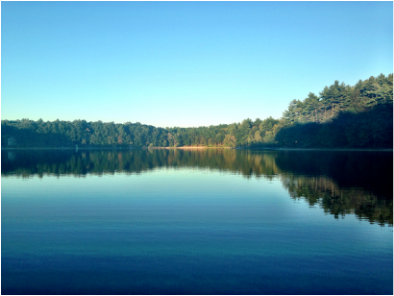 White Pond is a valuable natural resource with a noteworthy history that includes visits by Thoreau and Emerson. "Reservation Land" vs. "Conservation Land" -- There's a big difference! "Reservation Land" is reserved by the Town Selectmen for possible future development. "Conservation Land" is protected by the Division of Natural Resources from development and preserved in its natural state for future generations. Of the Town-owned White Pond lands, 40 acres are Reservation and only 10 are Conservation. Past development proposals for the White Pond Reservation have included a wastewater treatment plant and an array of solar panels. Any development of this type would forever alter the character of this natural landscape. Currently White Pond Reservation is not protected against future development and it is not being actively managed and regulated. As a result it is becoming degraded through misuse. The development of a comprehensive White Pond Management Plan that includes the permanent conversion of White Pond Reservation to Conservation Land is the key to solving the current problems and protecting White Pond for future generations. 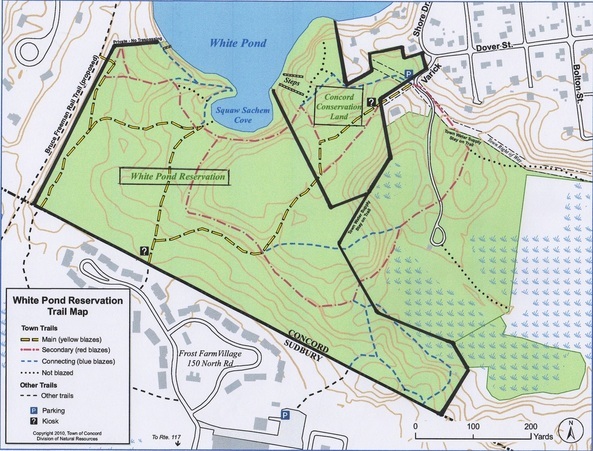 This was recommended by the White Pond Advisory Committee in its 2002 White Pond Reservation and Conservation Land Management Plan (p. 11-12), by Concord's Open Space and Recreation Plan of 2004 (p. 37, 68), and again in the 2014 Open Space Plan, (p. 24). This Plan describes the White Pond area's "fragile aquatic ecosystem" as an "important watershed protection" for the Town well, an "important wildlife habitat" and "wildlife corridor." The Town needs to resolve the issue of whether public swimming is allowed from its land. Currently the Town land at the cove is posted as "No Swimming". the Select Board voted at a Spring meeting to close the cove to swimmers for 2015. Can the Town provide public swimming at the cove so that it does not result in further erosion, degradation of the pond, and traffic/parking problems in surrounding neighborhoods? 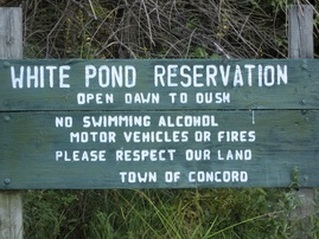 Or should public swimming be restricted to the White Pond Associates Beach at the eastern end that already provides Concord residents a place to swim complete with lifeguards, restrooms, trash cans and adequate parking? For those Concord residents who are not members of the Associates Beach, the town of Concord could purchase several memberships and offer day passes. Day passes would mean that Sachem's Cove could be protected as conservation land. The town of Concord is committed to limit encroachment of open land and nature. We need to strike a realistic balance between recreation and conservation in this fragile ecosystem. The White Pond Advisory Committee's Management Plans consistently recommend that the Town encourage the use of the picturesque trails and enforce the posted No Swimming regulations.